I am reeeeally hoping you guys are in on this pumpkin game as much as I am! I don’t think of myself as an overly obsessed with pumpkin/ pumpkin spice person, but every year this time comes and I find myself adding pumpkin to everything and LOVING IT! I think it is because I really only end up using it for 2 months of the year then it goes away, and I am a sucker for a limited time only kind of situation! 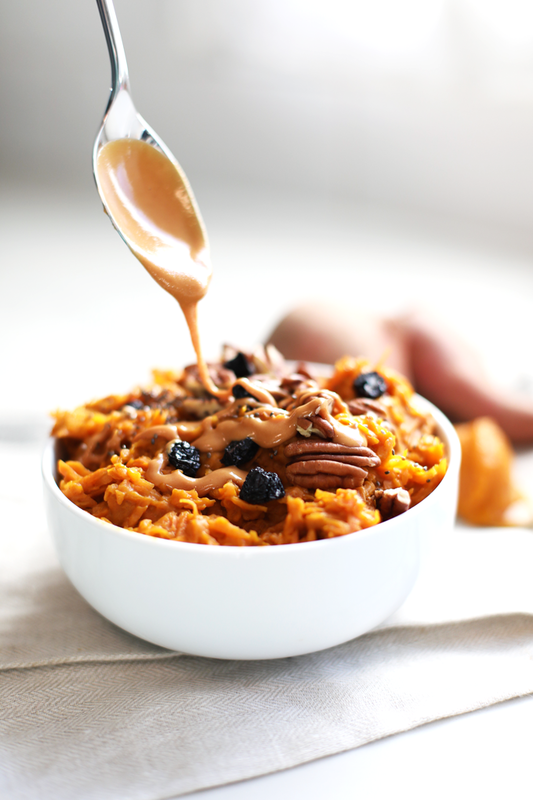 So after making 2 other kinds of Sweet Potat-“Oats” in my day – original and apple cinnamon – it was time to pumpkinfy it! My first two were Whole30 compliant because bananas naturally sweeten the first one and apples sweetened the second, but pumpkin isn’t naturally super sweet! So I added a little maple syrup to this one to make it perfect. You could probably leave it out but trust – it adds a lot to this! Now let’s talk about something I know I’ll get questions on – protein! Most people, me included, love protein at breakfast. So to add some to this I love drizzling it with nut butter and/or adding nuts on top. I also think adding some vanilla protein powder to this would be fabulous. But I also treat it like oats and use it as a comforting and tasty breakfast that you may or may not need a snack a couple hours after. Just being real! Either way it is deeelish and also super kid friendly! Okay I wanted to get this recipe out to you so not much more to touch on – as I write this while I get my oil changed and think it’s almost ready! Happy happy Friday!! Dried cherries are also LOVELY on top!! 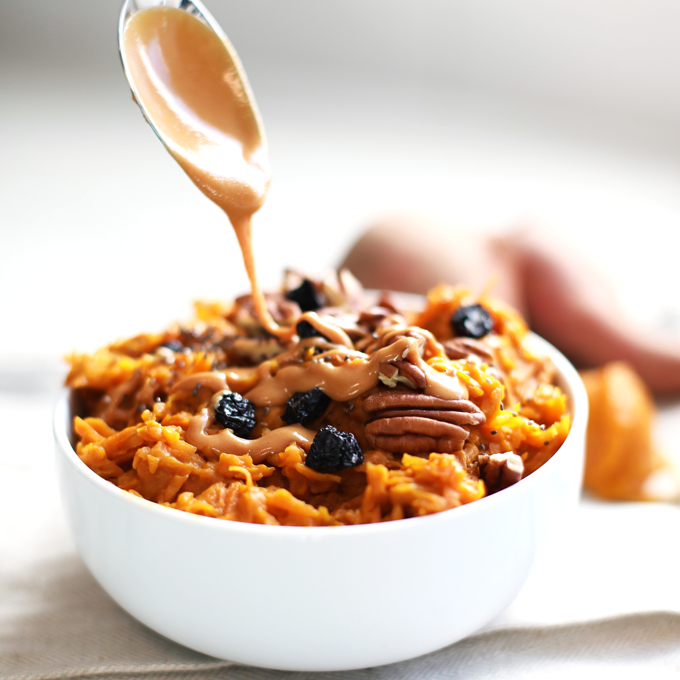 Pin this Pumpkin Spice Sweet Potat-“Oats” photo below to save the recipe for later! In a medium saucepan combine almond milk, pumpkin puree, maple syrup, and vanilla. Bring the mixture to a simmer and add in the sweet potatoes and pumpkin pie spice. 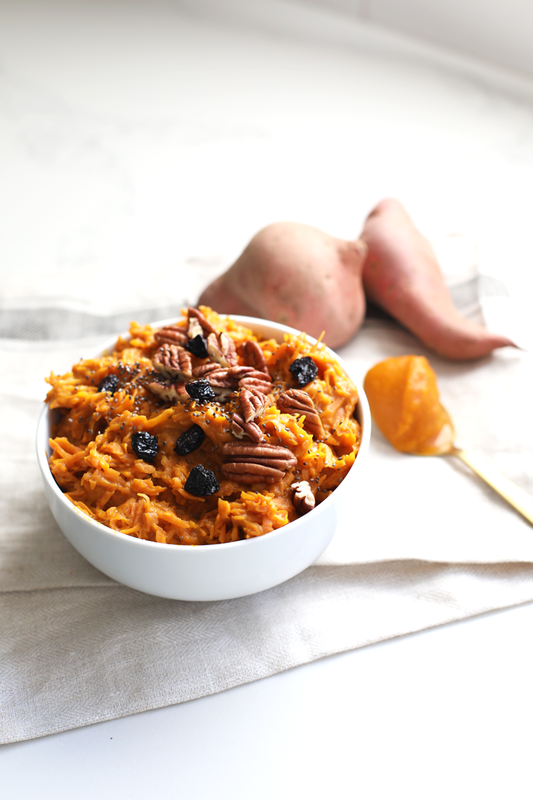 Stir to coat and cook over medium heat, stirring occasionally for about 5 minutes or until sweet potatoes are cooked. https://littlebitsof.com/wp-content/uploads/2017/10/pumpk-spice-sweet-potat-oats-feature.png 680 680 Kelsey https://littlebitsof.com/wp-content/uploads/2018/01/NEW-header-1.png Kelsey2017-10-06 03:00:002019-01-21 10:20:57Pumpkin Spice Sweet Potat-"Oats"
Oats in in quotes because they are grain free! 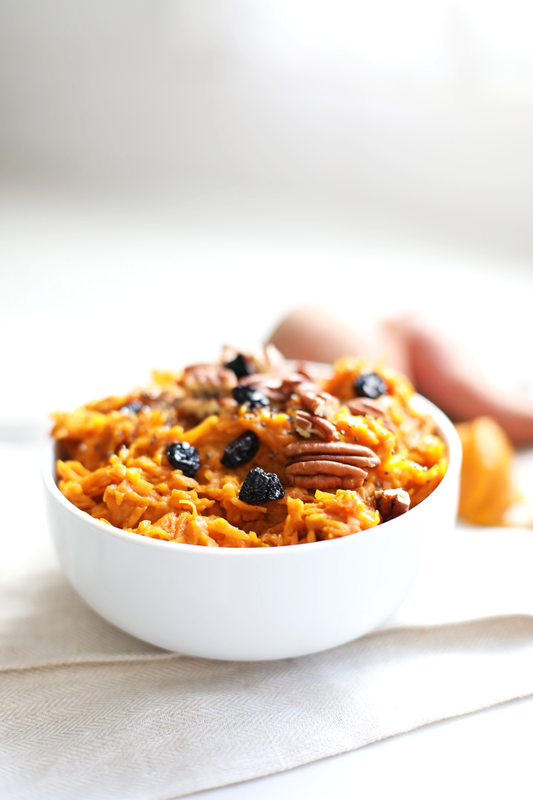 The sweet potatoes are the oat replacement!